I cannot express how happy I was about this, or how perfect it is for him to be back for the final season. It just wasn’t the same, and besides, he’s an important part of the story and the family. In the beginning of the episode, he had written a letter to the family describing a dream he had, where he was back at Downton with Sybbie... until he realized he wasn’t, and woke up in tears. He must have hopped on a boat right after mailing that thing, since he is now back for good. It came as a surprise, because by the end of the episode there was so much else going on that his letter got lost in the dust. Having him and Sybbie somewhere off in Boston for the end would have been strange, and this is just perfect. Did I say that already? Oh well. Back to business, and switching the tone a bit more serious: if the theme of the season is “conclusions,” season six should be the final stage of the traditional story format, the resolution, when everything gets wrapped up and the characters go off toward their happy endings. Tom coming back is a wonderful step in that direction. Mr. Carson and Mrs. Hughes getting married — also a step in that direction. Anna possibly being pregnant, Edith stepping up to the plate with her magazine and possibly, finally finding love are all very good steps in that direction. There’s enough drama in the other facets of the series to make up for the happiness in the meantime. Now, I don’t expect everything to be sunshine and rainbows. I don’t expect them to follow that rising/falling action structure that traditionally includes a happy ending. 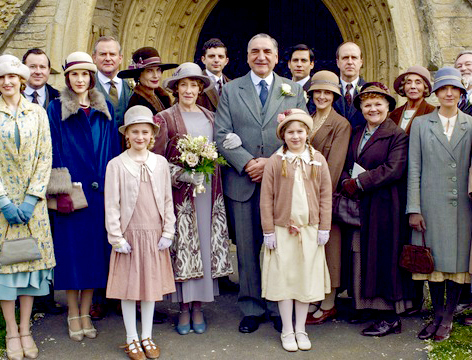 Downton Abbey is a complex series that veers towards a more literary style of writing; that is, a more true-to-life style without the “commercial” writing’s clear beginning, middle, and end structure. In those kinds of stories, there is a problem that arises, the problem is fixed, and in the end, everything is resolved. By introducing the theme of conclusions, we should expect a certain level of happiness, and well, resolution, to come from this season for the characters. However, by being a more “literary” series, Downton Abbey has to uphold a standard of realism. The special that aired before the premiere also pointed this out, saying that not everything will be wrapped up, that some characters’ arcs will be open-ended in order to preserve that realism. All that said, I’m wavering between having faith in Julian Fellows and being truly concerned. On one hand, there’s a lot of happiness going on. On the other hand, there’s a lot of happiness going on. And Lord Grantham had a pain in his chest, which he claimed was “indigestion.” This happened last season, and it ended up being something not too serious, something he would fix by eating healthier and not drinking. What if he hasn’t done enough and it’s gotten worse? This pain was never mentioned again during the episode, which is even more ominous. In a roughly 45-minute show, every scene has to count towards the whole. There’s simply too little space and too much money involved to have random little scenes that don’t contribute something. I do not — do not — want anything to happen to Lord Grantham. There’s no reason for it to. Yes, the show is known for its emotional sucker punches — it has proven that fact, and it doesn’t need to do any more proving. I get that it needs to uphold a standard of drama, but this is a final season, and audiences WILL make an allowance for extra happiness and less pain. Especially when it comes to the health of a beloved character like Lord Grantham. Let’s turn back to some happiness. It looks like Edith might finally be headed towards her happy ending. There was Patrick, who died on the Titanic, Fake-Patrick (or real Patrick, depending on what you believe), who got her hopes up, Strallan, who left her at the alter because he thought he was too old for her, and of course, Gregson, who was killed by the Nazis and left her alone with Marigold. Not to mention that the whole time, she’s been picked on by Mary. Edith hasn’t always been the kindest person, but she deserves to finally have a storyline that ends happily. Her editor looked like he was going to cry when she started interfering with the new issue, and he promptly hit the road before the end of the scene. It was welcome and a relief, but it left Edith and her secretary (?) with a magazine to publish within a matter of hours. Cue Bertie — one of the men from season five’s Christmas special — who went shooting at the Sinderby’s. Edith had to cancel getting drinks with him, and he offered to go with her at once, to make her coffee, bring her sandwiches, and “carry bits of paper around” — whatever she needed him to do. It was sweet, and sitting on that couch, they looked like two peas in a pod. He likes that she owns a magazine. He helped out with the writing, but stayed out of her way. Barrow found another job to interview for and he was greeted at the door by the owner himself, an older man with a rather sad story. The house’s interior was in shambles: nearly empty rooms, books thrown everywhere, no servants — just an old man and his memories. And Barrow, if he hadn’t been scared off (and rubbed the owner the wrong way in the process), would have been everything: butler, valet, footman (not that the house would need one), chauffeur, you name it. The man symbolized the old days, the last man in a house that was crumbling around him. I wonder if it will make Barrow look at his search and standards differently going forward. Cora brought the whole reception drama to an end by calling Mrs. Hughes into the library and having her say how she felt, once and for all. Cora had offered to Mrs. Patmore, “Don’t hesitate to charge it all to the house account,” but her generosity went further than that. She kindly listened as Mrs. Hughes explained why she wanted her own reception to be one of her own choosing, and the matter was decided. Until Mary put her two cents into it. “You think I’m a bully, I think you’re a snob.” Isobel immediately stood up for Cora, as she should have. Cora understood that Mrs. Hughes wasn’t Mr. Carson and wanted — needed — part of her life to be separate from work. She wasn’t being snobby, she was being kind. She was listening to what Mrs. Hughes was (and wasn’t) saying. Then Mary got back at her. It wasn’t her exact intention, but it seemed like an added benefit. She said Cora wouldn’t mind if Mrs. Hughes borrowed one of Cora’s coats to wear with the drab dress Mrs. Patmore had bought from a magazine for her. And Cora, being Cora, wouldn’t have minded... if she hadn’t come home from a bicker-fest with the hospital crew and found them rifling through her things. She made them get out, but later went down with a jacket for Mrs. Hughes to keep in a very touching scene. The morning of the wedding, Mr. Carson paced around his pantry nervously while Anna, Baxter, and Mrs. Patmore got Mrs. Hughes ready. The wedding itself was so well done. It was right to have it in the family church, by Reverend Travis, with the servants in the front row on one side, and the family on the other. All the men got boutonnieres, including Lord Grantham. And the reception! Major props (no pun intended) go to the set designers because that was a beautiful scene. Everyone was happy — the Carsons, the Bateses, TOM... everyone. Earlier in the episode, Bertie, upon hearing about the butler’s wedding, remarked “I love these stories. I wonder how much longer people will tell them.” I don’t know if the show has ever gone meta before, but it did just then, and it did it subtly and beautifully. The stories of servants getting married and the whole house celebrating was inevitably linked to having servants and big houses that needed them, and kept them in employment for years — in Carson’s case, pretty much his whole life. It was an event for them. Now, we live in an age where this is foreign to most of us, but here we are — watching such a story unfold, one that certainly stands for many real-life ones, and we feel how much it matters to these characters. Almost a century later, and these stories are still being told. Toddler cousins hugging. Too much cuteness. Violet waved her cane in her son’s face and it was hilarious. Maggie Smith is a treasure. Everyone on the show is top-notch, but they’re so lucky to have cast her as the Dowager Countess. No one else could have ever played her. By the way, why did Denker cover for Spratt and his nephew? Just as something to hold over him, or something deeper? There were only four people at dinner: Cora, Robert, Mary, and Isobel. Has there ever been so few? The wide shots of Barrow walking to his prospective new houses in this episode and in last week’s were really nice. Isobel and Dr. Clarkson had another spat. Come on, show, you’re running out of time. Daisy needs to chill out a bit, I’m sorry, but it’s true. “I can’t see the future, Mr. Carson, then I suppose none of us can.” That’s ominous. “I missed everything, but Daisy doesn’t have to.” Molesley needs and happy ending. PLEASE, show, PLEASE. I think he’s getting Daisy a teaching job and that’s just so sweet. Also, Baxter needs a happy ending. HINT, HINT.